Of all of L.M. Montgomery‘s works, the Emily books are the ones with which I am most familiar. I guess this is the fourth time or so that I’ve read Emily of New Moon, and unlike certain others of her works, it doesn’t suffer much in the re-reading. Several years ago I wrote a critical paper about the Emily books, and I wish I could put my hands on it at the present moment. That was many children and several computers ago, alas. 🙂 However, due to my familiarity with it, I’m afraid that my thoughts here might be of the spoiler-ish variety because I tend to consider parts of her story in light of things that happen later. I offer that as a fair warning if you don’t want to know what happens in later books. Emily is often considered a darker version of Anne, or something like that. Of course, anyone who’s familiar with Montgomery‘s works at all knows that most of them, at least the ones about children, follow a certain pattern: an orphaned girl or a pseudo-orphaned girl (due to illness of a parent, etc.) finds love, acceptance, and comes into her creative birthright through the trials and tribulations she faces while growing up under the guidance of people who don’t always understand her. Of course, each character also has adults who love her and accept her for who she is: Anne has Matthew; Pat has Judy Plum; etc. After going to her mother’s people at New Moon after her father dies, Emily finds a kindred spirit (to quote Anne) in Cousin Jimmy, a sometimes-champion in Aunt Laura, and a hard-won supporter in Aunt Elizabeth, though this relationship is definitely not without its hard, hard moments. Like all of Montgomery‘s novels, there are eccentric characters aplenty in the Emily books, as well as a love of nature and home. What’s not to love? He is odd–a cynic, an intellectual, and an educated man who has money and travels. Still, I just have a hard time swallowing the whole relationship. There is no way under the sun I’d let my twelve year old daughter hang out with a thirty-something year old man, even if he was some sort of distant relative-by-marriage. Even if he was really smart. Even if he had lots of money. Honestly, I’ve never liked him. Even when I read this trilogy as a young teen myself, I found him a bit on the creepy side. There are plenty of things about the story to like, though, Dean Priest notwithstanding. My favorite parts are the bits with the merry quartet of friends: Emily, Ilse Burnley, Teddy Kent, and Perry Miller. Ilse, poor, neglected Ilse, has always been one of my favorite Montgomery characters. I love her snap and vigor. I love her appearance. I love her vocabulary. 🙂 She calls Emily a “puling, sniveling chit” and a “proud, stuck-up, conceited, top-lofty biped” (118) when they have their first fight, and you’ve got to love a girl with an arsenal equipped with words like that. 😉 She is smart and proud and vulnerable, and I just love her. Teddy Kent is a bit too perfect, maybe, but it’s obvious that Montgomery is setting up something between him and Emily, so it’s interesting. And Perry Miller, well, could he there be a more interesting character to turn the staid existence at New Moon on its ear? Of course, he gets his own sort of redemption, thanks to the fact that he, too, is a genius. Montgomery has created a quartet of exceptional children and put them all together in a little village on Prince Edward Island; how can we not expect things to get complicated as they grow into their teen years? That’s the other thing I noticed this time around. Maybe it’s true for all of Montgomery‘s stories and I just noticed it this time, but she does an awful lot of setting up of things in this first story. We expect something to happen with Dean Priest; we expect something to happen with Teddy Kent. How can it not? Although we tend to (maybe?) think of most of Montgomery‘s books as children’s stories, really, they’re not. There’s such a subtle undercurrent of adult feelings and emotions and intentions throughout many of them, or at least the ones I’ve read this time around. I think it’s particularly true of the Emily stories. Perhaps that, as well as a host of other things, contribute to Montgomery‘s enduring popularity even among adults. I also think it’s one of the reasons I can’t figure out quite when to introduce my girls to Montgomery. That copy up there of Emily of New Moon isn’t the one I have. 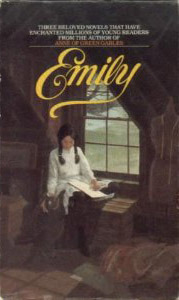 I have the old Bantam paperback boxed set of the Emily books, which is pictured second below. According to Wikipedia, the one immediately below is the first edition. Isn’t it lovely? Still, I’ve come to think of Emily as the girl in the windowseat, writing away with Saucy Sal or Daffy or some cat by her side. I’m really glad I read Emily this time around, and I only wish I had time to read the second and third books in quick succession. Since Les Miserables and the Armchair Cybils took up most of my January, I’ll have to content myself with book one this year and wait for next year to pick up Emily’s story again. I would like to watch the Emily movie, and I’m pretty sure at least one local library has it. Maybe I’ll do that soon. 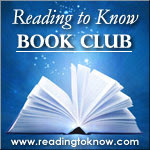 Thanks, Carrie, for encouraging me to revisit a beloved author every January! Very intriguing review, Amy! I haven’t read any Emily books, but I see what you mean about there being plenty here to keep adult readers interested.I will have to meet Emily this year. “She calls Emily a ”puling, sniveling chit” and a “proud, stuck-up, conceited, top-lofty biped” (118) when they have their first fight, and you’ve got to love a girl with an arsenal equipped with words like that. ;-)” – LOL!!! You’re right – Montgomery does do a lot of setting up in her first books. You just know something is going to happen. And I think you are also right that Montgomery is not really for children (or, perhaps JUST for children) because of all the adult emotions involved. You made me want to re-read Emily …although at present she’s probably my least favorite of the characters. I only skimmed bc I haven’t read Emily yet. The 30 year old does sound a bit creepy! Though these can be enjoyed by children, I don’t consider them children’s books despite where the library shelves them. 🙂 I’ve only introduced Anne to my 6 yo through the movies and a picture book, but she knows it’s a book for when she’s older. Now you got me wanting to re-read Emily. I do agree with your observation that her books are more for adult’s than children, though I think you can start reading them when your younger and enjoy them into adulthood since they have so many layers. I was in a bookstore one time and this lady was bragging on how her 5 year old had already read Anne of Green Gables. I felt sorry for the little girl since she probably missed so much from the story that she couldn’t understand and who knew if she would ever re-read it. My daughter first listened to the audio when she was 11 and also listened to it again this time around. I think she got more out of it this time, but she enjoyed it both times. I almost mentioned Dean Priest, too — I don’t know why I didn’t. But I found all of that rather creepy as well. For a guy in his thirties to look at a girl in her preteens and start thinking ahead…well, I guess that is done in other cultures, but it makes me shudder. I wasn’t sure for a long while if I liked her as well as Anne, though she is probably more realistic than Anne. But some of the rough spots evened out in the end and I imagine will develop even more in the next books. I had hoped to read those, too, but just didn’t get to them. I agree wholeheartedly about Dean Priest. A little overly concerned with Emily in my opinion. : ) You make me want to pull Emily out again!